Lee v. Brain & Spine Specialists, P.A. Brain & Spine Specialists, P.A. This lawsuit involves unnecessary spinal surgery. A Cecil County man is in a rollover car accident while working as a test driver at Aberdeen Proving Grounds. He complains of pain in his head, neck, shoulders, arms, and upper back. Radiological studies and the Defendant doctor's physical exam are essentially normal. X-rays and an MRI are negative with the exception of a small herniated disc in the man's back at C6-7. Nothing seems to explain the man's symptoms. The man pursues chiropractic treatment for six weeks. When his condition does not improve, he returns to the office of the Defendant doctor. Without any additional testing or treatment, the Defendant doctor recommends and performs a 4 level cervical fusion from C3 to C7. Postoperatively, the man suffers an esophageal injury and vocal cord paralysis. The man alleges that his injuries are the result of either improper retractor placement or the failure to release the retractors during surgery to relieve the pressures on the medial soft tissue structures by the Defendant doctor. The man files a medical negligence lawsuit against the Defendant doctor in Baltimore County. He alleges that the Defendant doctor violated the standard of care in (1) failing to diagnose his conditions, (2) failing to employ appropriate treatments, (3) failing to adjust treatments in response to evaluation of the effects of prior treatments, (4) recommending and performing extensive four level cervical fusion, (5) failing either to properly place the retractors and/or failing to undo the retractors and release the pressure caused by the retractors part way through the surgery, and (6) failing to appropriately and adequately obtain an informed consent. The man alleges that as a result of the Defendant doctor's negligence, he has suffered unnecessary surgery, infection, permanent loss of movement, function and use of his neck, swallowing and speaking difficulties, and severe pain and suffering. The man filed loss of consortium and informed consent claims in addition to the medical negligence claim. His wife also filed a loss of consortium claim. Failed to appropriately and adequately obtain informed consent. Gary J. Lustgarten, M.D. : board-certified in neurosurgery. This doctor has an extensive history of testifying in medical malpractice cases. This appears to be a two prong case for the Plaintiff. The first part is that the surgery should never have been performed. Juries understand that neck surgery is not something you want to jump into and there were many treatment modalities that the neurosurgeon just drove past. It is hard to argue that a four-level surgical fusion should be the first line of defense when there is neck pain of an unknown etiology. Had the doctor not performed the surgery, he would not have suffered the esophageal and vocal cord injuries. So that case against the physician can stand alone even without a surgical error. The second prong is the surgical error due to negligent use of retractors during the surgery. It is unclear from the complaint and the expert report how aggressively Plaintiff will pursue this angle. Normally, the progression of treatment in these types of suspected disc injury cases is physical therapy or chiropractic care, injections (trigger point, facet, or epidural blocks) and then medication. Ther average verdict is $3,945,456. Cases involving informed consent averaged just over $2 million. Interoperative errors averaged nearly $3.7 million. Wrong level surgeries -- operating on the wrong disc -- had low compensation. Why? The injuries are usually not as signficant as in other spinal surgery cases. If you have had an unnecessary or negligently performed medical procedure or operation, Miller & Zois can help you. You deserve justice and monetary compensation for your economic losses and pain and suffering. Miller & Zois has a long history of results in medical malpractice cases in Maryland, earning substantial verdicts and settlements. Call today to speak to a caring attorney who is ready to listen to you at 800-553-8082 or get a free, no obligation online case review. A spinal surgery infection case filed in April 2017. 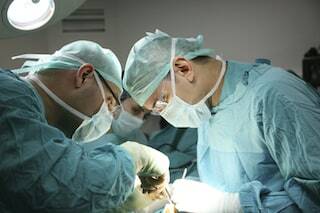 Many surgery cases are informed consent claims. CALL 800-553-8082 or get a free online medical malpractice serious injury and wrongful death claims. Miller & Zois handles claims throughout the entire state of Maryland and Washington, D.C.